Sharing your space with an animal doesn’t mean you have to live like one. You can have animals and have beautiful furniture too, you just have to know a few interior design basics. Instead of banishing your furry friend to the backyard, consider your new needs as a pet owner, as you redecorate your living space. Pets will always bring some level of hair and scratching, but there are some fabrics that wear better than others over time. As an added bonus, what’s good for pets is also good for kids and guests, so with the right fabric choices, your home will remain ready for even the biggest messes. Consider these five fabrics that will keep your home looking great, even as animals do their worst. Microfiber and Ultrasuede are any pet lover’s dream. They’re about as close to “pet proof” as it gets. The fabrics feels as smooth as suede, and hair can be easily removed with a lint roller or even your hands. The synthetic fabric holds up great to light scrubbing with soap and water when inevitable stains happen. It won’t rip or scratch either. 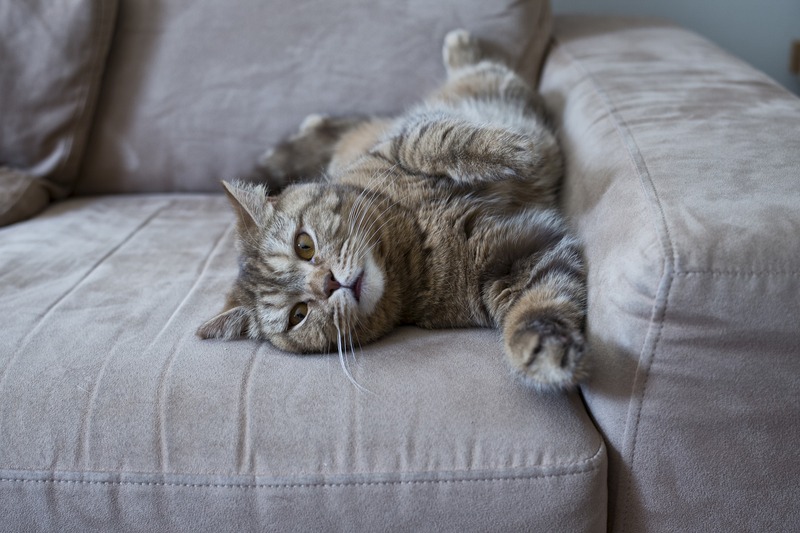 If you want furniture that will hold up to your pet’s biggest messes, consider microfiber. Leather can be a nice option because hair won’t stick to it, or it can be brushed off easily. Leather products can be wiped down with leather cleaner when they get dirty, and leather is also largely odor-resistant. While leather does scratch, that doesn’t have to be a bad thing. The vintage leather look is classic and timeless and after a while of wear, you’ll get a nice custom patina. If pristine, shiny leather is the look you’re going for, however, you should consider not letting pets make themselves at home on that particular piece of furniture. As an animal lover, you might wish to stay away from cowhide leather. Modern pleather will give you the same desireable qualities. Putting a canvas slip cover on any furniture adds a layer of security for pet owners. Canvas is made to be durable, so there are no worries about claws creating rips, and when the canvas covers get dirty, they can easily be removed and tossed in the washing machine. If you haven’t looked at couch or furniture covers lately, it’s time. No more ill-fitting sheet-style slips. Today’s covers are custom-fit to give your living room an elevated look. Choosing denim furniture is committing to a casual feel for your room, but lots of homeowners prefer this look. Just like your favorite pair of jeans, denim furniture is classic, durable and easy to clean. Engineered in Kings Mountain, North Carolina, this fabric is stain, moisture, bacteria and odor resistant, making it a great alternative. It’s soft, durable and easy to clean. Satin does not hold up against moisture, so any pet drool or spot cleaning will likely leave permanent damage. If you simply love the shiny fabric, stick with satin curtains or other home surfaces your pets won’t lay on. Velvets act like Velcro when it comes to pet hair. They also get crushed easily, so any need for cleanup, or even too much roughhousing and traffic, will cause irreversible damage to the fabric. Chenille. Those beautiful, tiny loops, can be totally destroyed by animal claws. Once the threads are pulled, they are impossible to repair. Tweed can create a trap for pet hair that will be nearly impossible to clean, so it’s best to stay away. If you’ve been eyeing another fabric, just keep in mind that, generally, dark colors will be best for hiding dirt and pet hair. A tight-weave fabric will make it easier to remove hair since it won’t get trapped in the weave, and fabrics with a pattern or texture will help hide small scuffs, stains or snags. Of course an animal’s individual fur coloring and personal habits will vary, as will your milage in different rooms of your home, so you probably have the flexibility to include all of your favorite fabrics somewhere to your home — just be smart about it. If pets prevent you from getting that gorgeous velvet love seat for your living room, maybe the same piece would work in the dining room where the dogs usually avoid. Use this interior information as a guide, but keep your family’s own home habits in mind. For over 10 years, we were selected number one overall in the Valley News Dispatch Reader's Poll as the absolute best place to purchase furniture in the Allegheny-Kiski Valley. © 2019 Arnold Furniture | All Rights Reserved.